As we noted in the previous article, without America’s 11th hour mobilization, the Great War would have ended in a stalemate of exhausted, bankrupted, demoralized European combatants in 1917. There would have been no abomination known as the Versailles peace treaty because it was a toxic peace of victors. But without America’s tens of billions of aid and munitions and two million fresh American troops (doughboys) there would have been no Allied victors, as we demonstrate below. Without Versailles, in turn, there would have been no “stab in the back” legends owing to the Weimar government’s forced signing of the “war guilt” clause; no continuance of England’s brutal post-armistice blockade that delivered hundreds of thousands of Germany’s women and children into starvation and death in the winter and spring of 1918-1919; and no demobilized 3-million man German army left humiliated, destitute, bitter and on a permanent political rampage of vengeance. So, too, there would have been no acquiescence in the dismemberment of Germany at the Versailles "peace" table. 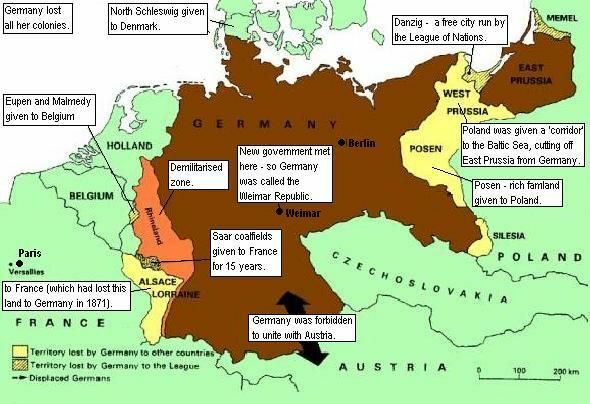 As it happened nearly one-fifth of Germany’s pre-war territory and population was spread in parts and pieces to Poland (the Danzig Corridor and Upper Silesia), Czechoslovakia (the Sudetenland), Denmark (Schleswig), France (the Saar, Alsace-Lorraine and the neutralized Rhineland) and Belgium (Eupen and Malmedy). This sweeping loss of territory also meant Germany lost 50% of its iron production capacity, 16% of it coal output and 100% of its far flung colonies in Africa and East Asia to England and France. Needless to say, god did not create the map of Europe on the 6th day of his labors. But it is absolutely the case that it was the vast German territories and peoples "stolen" at Versailles that provided the fuel for Hitler’s revanchist agitation; and it was that campaign to regain the lost territories which nourished the Nazis with patriotic public support in the rump of the fatherland. Likewise, the French-Belgium occupation of the Ruhr in 1923 would not have happened because the justification for that invasion of German lands was that the latter had not paid its oppressive war reparations – a staggering sum that would amount to more than $500 billion in today’s purchasing power. As it happened, it was the reparations crisis that led to Germany’s insane printing press monetary spree and the destruction of the German middle class in the 1923 hyperinflation. And without that society-crushing development along with all of the above, the history books would have never recorded the Hitlerian ascent to power and all the evils that flowed thereupon. Even John Maynard Keynes, who was a British Treasury official at Versailles, could see that the Carthaginian Peace of Versailles was only sowing the seeds of economic breakdown in Germany and throughout much of warn-torn Europe. The Treaty includes no provisions for the economic rehabilitation of Europe,– nothing to make the defeated Central Powers into good neighbors, nothing to stabilize the new states of Europe, nothing to reclaim Russia; nor does it promote in any way a compact of solidarity amongst the Allies themselves; no arrangement was reached at Paris for restoring the disordered finances of France and Italy, or to adjust the systems of the Old World and the New. The Council of Four paid no attention to these issues, being preoccupied with others,– Clemenceau to crush the economic life of his enemy, Lloyd George to do a deal and bring home something that would pass muster for a week, the President to do nothing that was not just and right. It is an extraordinary fact that the fundamental economic problems of a Europe starving and disintegrating before their eyes, was the one question in which it was impossible to arouse the interest of the Four. Reparation was their main excursion into the economic field, and they settled it as a problem of theology, of politics, of electoral chicane, from every point of view except that of the economic future of the States whose destiny they were handling. What a use could be made of the Treaty of Versailles. … How each one of the points of that treaty could be branded in the minds and hearts of the German people until sixty million men and women find their souls aflame with a feeling of rage and shame; and a torrent of fire bursts forth as from a furnace, and a will of steel is forged from it, with the common cry: "We will have arms again!" So Woodrow Wilson has a lot to answer for because he is the father of the Carthaginian Peace that broke the world at Versailles. But the matter is far greater than just Wilson’s Folly of leading the US into war in April 1917. His reasons for doing so are all the more important. Wilson’s 14 Points and his "make the world safe for democracy" slogans were essentially the original and incipient vision of the Indispensable Nation. Ironically, therefore, the false idea that triggered the whole train of 20th century events, which then mid-wifed the American Empire, is now used to justify the continuing disorder and mayhem that it has unleashed upon the world. Accordingly, Wilson’s own “war guilt” is a mighty stain, extending to most of the wars of the 20th century. That because America’s wholly unjustified entry into a war that was already nearly over – actually prolonged the original Old World catastrophe for decades to come. So doing, it first fostered the 1000 year flood of totalitarianism in Germany and Russia, and from that the Indispensable Nation folly that continues to bedevil the entire world. In this context, it is essential to recall that the Great War was about nothing worth dying for and engaged no recognizable principle of human betterment; it was not the case of a short-run necessity that inadvertently gave rise to a later, greater evil. Among the cast of characters who broke the world in the summer of 1914 there were many blackish hats, but no white ones. The onset of the Great War, in fact, was an avoidable calamity issuing from a cacophony of political incompetence, cowardice, avarice and tomfoolery. In part, you can blame the bombastic and impetuous Kaiser Wilhelm for setting the stage with his foolish dismissal of Bismarck in 1890; his failure to renew the Russian reinsurance treaty shortly thereafter (which forced the Czar to ally with France); and his quixotic build-up of the German Navy after the turn of the century (which turned much of English opinion against Germany). Likewise, you can blame the French for lashing themselves to a war treaty that could be triggered by the intrigues of a decadent court in St. Petersburg where the Czar still claimed divine rights and the Czarina ruled behind the scenes on the hideous advice of Rasputin. Similarly, you can censure Russia’s foreign minister Sazonov for his delusions of greater Slavic grandeur that had encouraged Serbia’s provocations of Austria after Sarajevo; and you can also castigate the doddering emperor Franz Joseph for hanging onto power into his 67th year on the throne and thereby leaving his crumbling empire vulnerable to the suicidal impulses of General Conrad’s war party. So too, you can indict the duplicitous German Chancellor, Bethmann-Hollweg, for allowing the Austrians to believe that the Kaiser endorsed their declaration of war on Serbia; and pillory Winston Churchill and London’s war party for failing to recognize that the Schlieffen Plan’s invasion through Belgium was no threat to England, but a unavoidable German defense against a two-front war on the continent. But after all that – you most especially can’t talk about the defense of democracy, the vindication of liberalism or the thwarting of Prussian autocracy and militarism. The British War party led by the likes of Churchill and General Kitchener was all about the glory of empire, not the vindication of democracy. So, too, France’ principal war aim was the revanchist drive to recover Alsace-Lorrain. The latter was mainly a German speaking territory for 600 years until it was conquered by Louis XIV in the 17th century, and then forcibly re-acquired by Germany after its humiliating defeat of the French in 1870-71. In any event, German autocracy was already on its last leg as betokened by the arrival of universal social insurance and the election of a socialist-liberal majority in the Reichstag on the eve of the war; and the Austro-Hungarian, Balkan and Ottoman goulash of nationalities, respectively, would have erupted in interminable regional conflicts and nationalist fragmentation, regardless of who won the Great War. Previous Previous post: Bolton’s Met His Match – Melania! Next Next post: Is Korea’s Cold War About to End?